Aboard the International Space Station, commander Leroy Chiao offers his thoughts in this downlinked message in honor of Veterans Day. 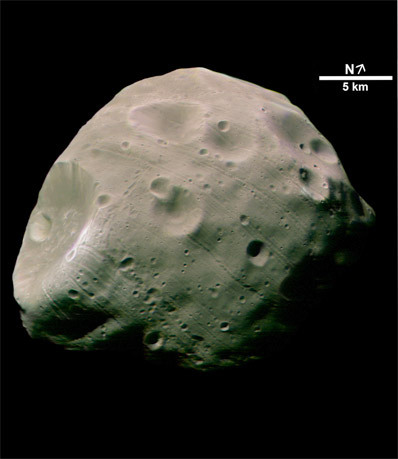 These images, taken by the High Resolution Stereo Camera (HRSC) on board ESA's Mars Express spacecraft, are Europe's highest-resolution pictures so far of the Martian moon Phobos. These HRSC images show new detail that will keep planetary scientists busy for years, working to unravel the mysteries of this moon. 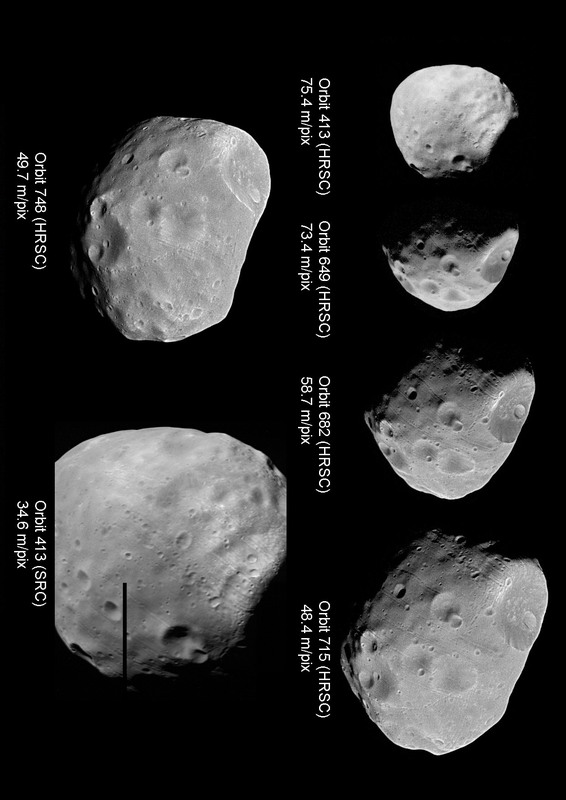 The images show the Mars-facing side of the moon, taken from a distance of less than 200 kilometres with a resolution of about seven metres per pixel during orbit 756. The HRSC provided an unprecedented near-simultaneous group of 10 different images of the surface, enabling the moon's shape, topography, colour, 'regolith' light-scattering properties, and rotational and orbital states to be determined. The regolith is the small-grained material covering most non-icy planetary bodies, resulting from multiple impacts on the body's surface. The global 'groove' network is seen in sufficient detail to cover the Mars-facing surface continuously from near the equator up to the north pole with regular spacing between the grooves. 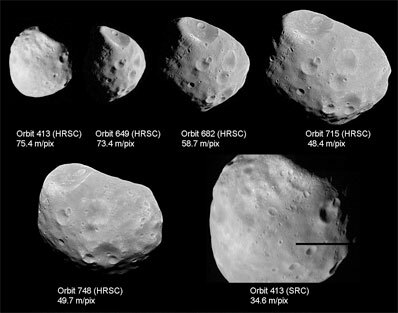 It now may be possible to determine whether the grooves existed before the large cratering events, and exist deep within Phobos, or came after the cratering events and were superimposed on them. This tiny moon is thought to be in a 'death spiral', slowly orbiting toward the surface of Mars. 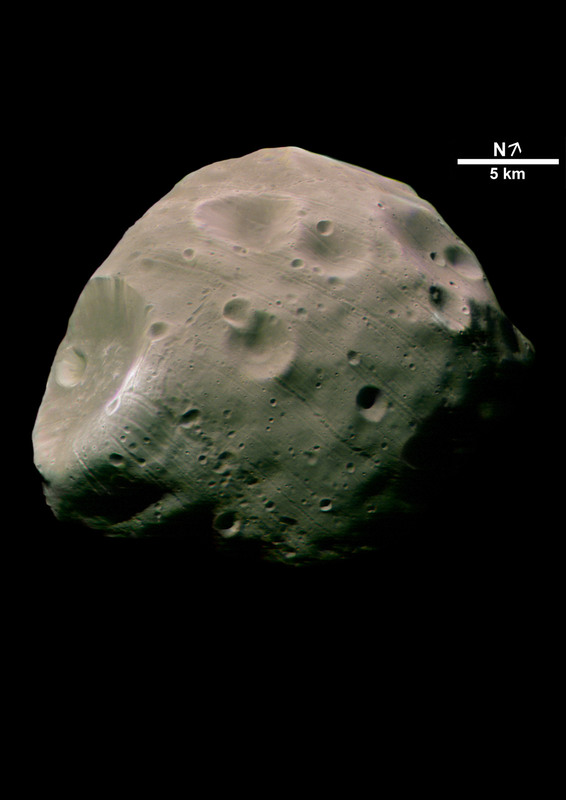 Here, Phobos was found to be about five kilometres ahead of its predicted orbital position. This could be an indication of an increased orbital speed associated with its secular acceleration, causing the moon to spiral in toward Mars.